క్రీ. శ. 1 వ శతాబ్ది. 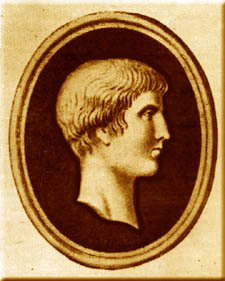 Marcus Valerius Martialis , known in English as Martial (March 1, between 38 and 41 AD – between 102 and 104 AD), was a Roman poet from Hispania (the Iberian Peninsula) best known for his twelve books of Epigrams, published in Rome between AD 86 and 103, during the reigns of the emperors Domitian, Nerva and Trajan. In these short, witty poems he cheerfully satirizes city life and the scandalous activities of his acquaintances, and romanticizes his provincial upbringing. He wrote a total of 1,561, of which 1,235 are in elegiac couplets. He is considered to be the creator of the modern epigram.